Functional Anatomy of Tatooine Megafauna (Hyperspace Transmission Received) | What's In John's Freezer? I write to you with the detailed correspondence I promised for your “blog carnival“, whatever that is, and in honour of our Fourth Empire’s glorious leader Empress Syrrhosyx—may her inestimably wise and orderly rulership soon grace your distant world as it has our not-so-far-away galaxy. I hope that my Galactic translator continues to function properly with your crude technology. Our Empire’s embrace would grant your culture midi-chlorian-powered devices that would make our dialogue far simpler via intermental transmission, with minimal apparent side effects for you. You need not worry about the apocryphal stories that your people told about our first Imperial Age. That Skywalker kid was a terrorist, pure and simple. However, our inside sources reveal that the “documentary” in progress by the Terran named Jjabrams includes a rather accurate portrayal of the perfidious giant muromorph race from planet Dis’snai. “Baby steps”, as you say. Our communications continue to be crippled by the mynock infestation that has plagued my orbital facility, and moreso by your own barbarian apparati. Thus the resolution of my images included here is a pale reflection of what our holo-imaging can achieve. But your readers can click the images to enhance their magnitude. Two fragmentary skeletons of small Krayt Dragons, from the Corellian Science Museum. (Image source here) Note their short necks and quadrupedal limbs. 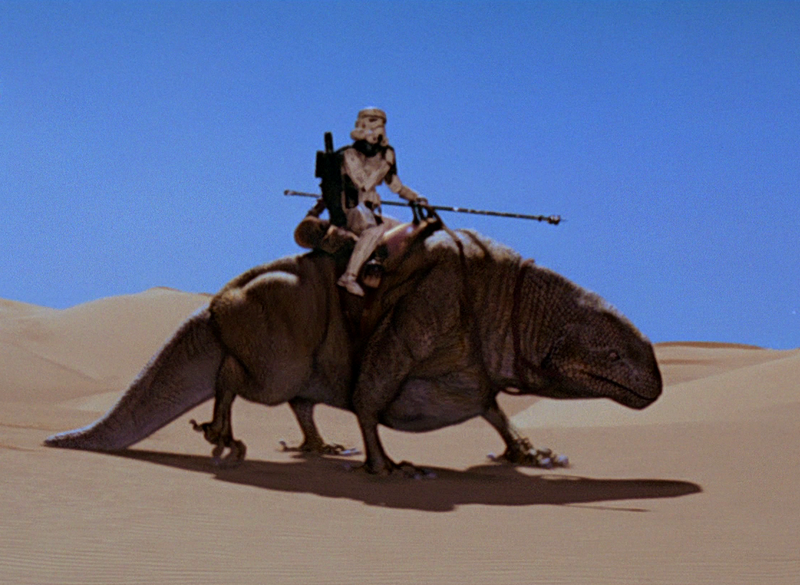 Stormtrooper on a Dewback in the Eastern Dune Sea (image source here). Note how gracile the limbs are below the elbows/knees. 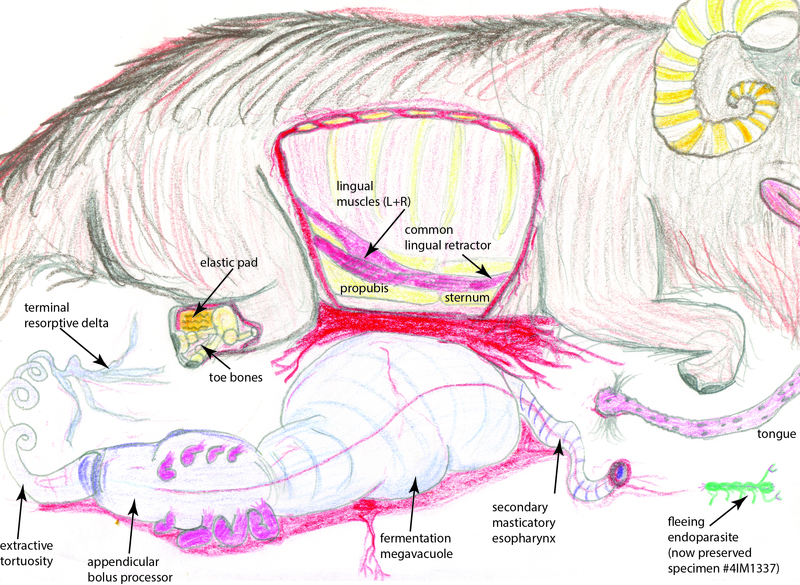 Jawa 37C-H4 sketching droid illustration: My dissection of a common dewback, showing (ventral view) the caudofemoral muscle and tendon, tail fat body (obscured by the nearby muscle), and fibrous pads used while resting on the sand. My main observations support those of prior scholars, even from the Rebel Alliance era (bucking the trend of having to correct all their mistakes! ): dewbacks have earned their moniker well by the characteristic water-condensing tissues on their dorsal surfaces. Microdroid explorations of these tissues, which lie within a dimpled midline ridge, house a high density of capillaries in a countercurrent network that surrounds a large number of specialised pores, or stomata, which smooth muscular rings contract to pull open when humidity, temperature and shade are best suited to cooling the surrounding air (via air currents encouraged by the stomata, and by local cooling via the capillary rete). Previous scholars overlooked this mechanism, which conducts excessive warmth to the heat-emanative fat bodies in the bulky tail and the neck hump (my dissections nicely revealed these; similar tissues are concentrated in the foot pads and sternal pad). The mechanism also allows the body to be up to 20% cooler than the ambient air; an analogous adaptation to that seen in the banthas (below). My peers also failed to realize that the social nature of the dewback is key to its water conservation: while the stomatal rete can draw in some condensed water, it is far more effectively ingested by licking the backs of fellow dewbacks. Lone dewbacks thus are more prone to dehydration. The night-time group-huddling habits of dewbacks to conserve heat that they would otherwise too easily shed in the cool night air is yet another testament to the benefits of their sociality. As ectotherms, dewbacks are slaves to the hot-cool cycles of the Tatooine wastes, but their sociality liberates them. Further escape comes from their large size (>800 kilograms of Terran mass units), which renders them mostly homeothermic, but never endothermic like some of your otherwise unimpressive Terran reptiles of past or present. 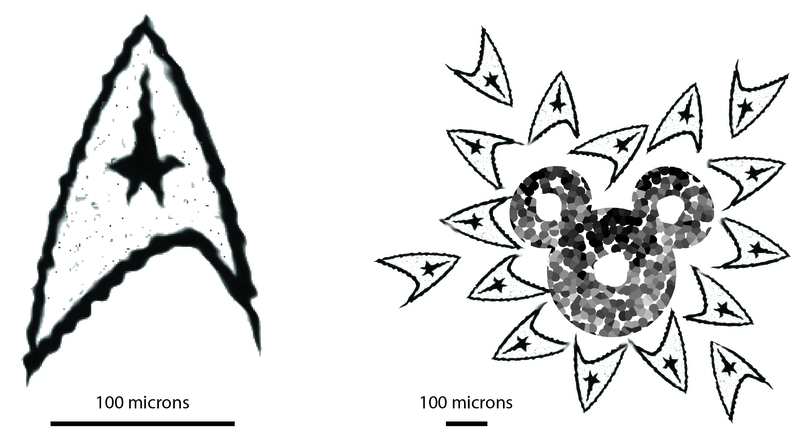 A laser-histology trek by microdroids showed the “scaled” hide around the rest of the body to be composed of siliceous material embedded in the thickly fibrous connective tissue of the skin, forming stereotyped arrowhead-shaped “siliceoderms”, as I term them, shown below. Curious microstructure of the small “siliceoderms” from dewback skin that I have described– single ‘derm on the left, multiple ‘derms surrounding a stoma on the right. To see these structures, one must view the “scales” at high magnification, ideally with microdroids. I surmise that: (1) these siliceoderms are formed of fused Tatooine sand grains; (2) the grains become embedded into the soft, pliable skin as dewbacks grow, giving them insulation and physical protection; (3) young dewbacks display a previously mysterious behaviour of “sand-rolling” that encourages this embedding during the maturation of a dewback; and (4) the high strength and stiffness of this composite skin not only armours dewbacks but also pressurizes them, ensuring that blood can circulate through their large bodies without backflow or clotting issues, particularly in their gracile lower limbs, which are themselves passively supported by their skin tissues. With your interest in animal locomotion, you may be curious about tales of how dewbacks can outrun landspeeders, especially in poor weather or terrain conditions. The skin-stiffening agents noted above surely play an important role in this. 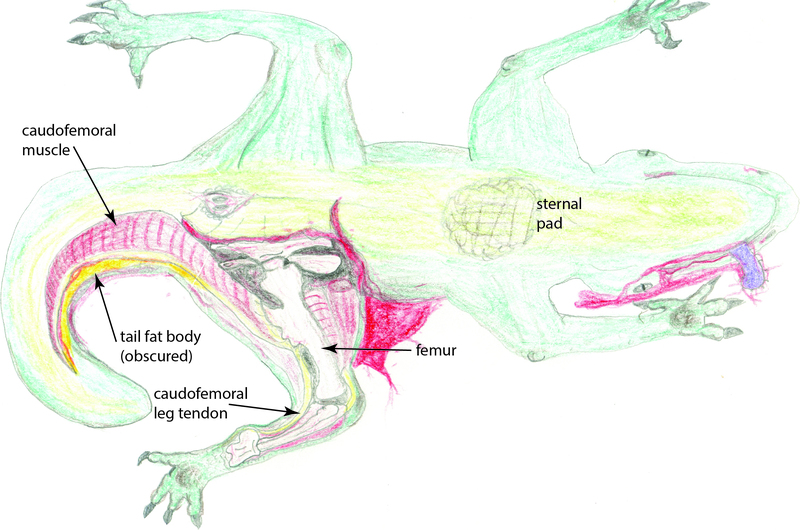 Indeed, much like your terrestrial varanid lizards, dewbacks do not follow the usual trend of straightening their limbs to support their body more effectively at larger body sizes (improving “effective mechanical advantage” as your field terms it), but they do draw them more closely under the body rather than remain sprawling. I revisit the matter of limb posture toward the end of my transmission. Furthermore, the huge caudofemoral muscle shown above is able to transmit force from the tail to the thigh, and then its thick tendon transmits the force down the limb to the feet, acting as one strong limb extensor that powers and supports locomotion. No Terran animal does it so well. Banish any thoughts of how the dewback’s wrists and ankles seem implausibly thin– they are pressurized cylinders of dense tendon and bone, more like a Terran horse’s distal limbs than any lizard’s, and linked to far larger tail-to-thigh muscles. The expansive foot pads and reversed first toe (hallux; as in your Terran birds but with no association to arboreality) likewise give dewbacks a stable base of support and spread out their weight over the treacherous desert sands, reducing the work otherwise lost to deforming the sand’s surface and also keeping pressures on their feet at safe levels. Thus dewbacks have many features that explain their reputation for bursts of fast speed (~14 Terran meters/second or 50 kph/30 mph). Yet whilst during the daytime and over short distances dewbacks can outpace banthas or humanoids on foot, their ectothermic nature causes them to accumulate fatigue too quickly, and thus they must rest. So sans cybernetic enhancements, dewbacks will never be winning any podraces. Nonetheless, I am sure you are awed by how Tatooine’s native reptiliforms, the dewbacks, exceed any living Terran reptile in their size and extreme adaptations to aridity. I have not even described the variations seen in feral, grizzled, cannibal or mountain dewback species, which can surpass the common desert dewback’s. Toward the end of my transmission I will show you animals that exceed even the greatest dinosaurs in sheer glory and ferocity. 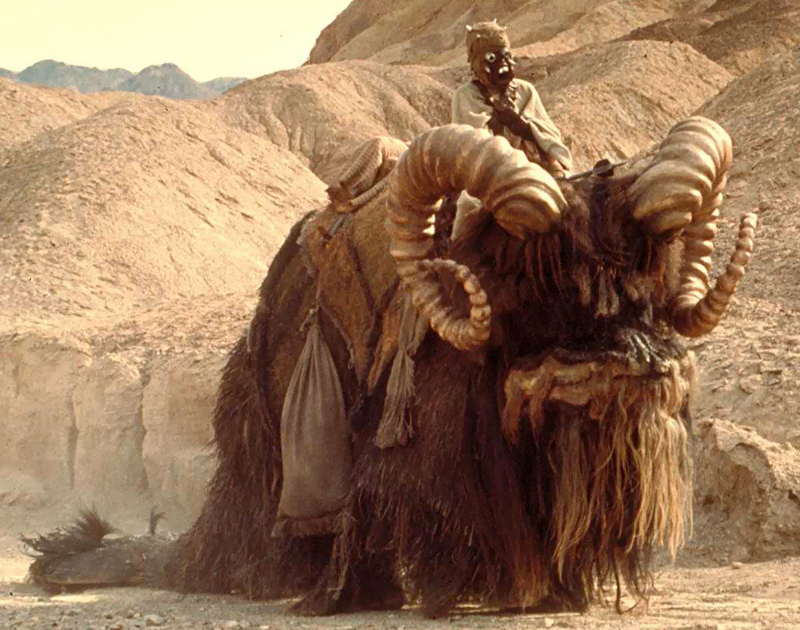 Convincing image of a Bantha being ridden by a Tusken Raider/Sand-Person, from your world’s Rebel propaganda film “Star Wars Episode IV: A New Hope”, by Lucasfilm/Twentieth Century Fox. I don’t know how your Terran science-invigilators managed to get accurate information on bantha tongue anatomy (above) but I have to credit them, they almost got it right. With your can-do attitudes combined with your bungling mistakes, you’d make good Fourth Rebel Alliance members, but don’t get any new hopes. However, as the illustration below shows (and I had to leave the guts in the picture for their sheer impressiveness! ), the tongue-projection mechanism extends not around the rear of the skull (occiput) and into the eyes or sinuses, but far back along the giant, spar-like breastbone (sternum) to the hips (pelvis, or propubis). That mechanism’s powerful projection can extend the tongue as far as 3 Terran meters (10 feet). The tongue is expelled by stretching and then releasing (slowly for precise control, or quickly for a catapult action) a fibrous sac that surrounds the base of the tongue, and this sac then recoils elastically when released to withdraw the tongue. I’ve studied your Terran elephant and chameleon and it combines aspects of both of these, with the tongue having several layers of fine muscle fibres as in the former animal, and the “power amplifier” catch mechanism of the latter, thus providing a superior combination of control and speed. All of these are rightly called muscular hydrostats, but the bantha’s is the best. You might mention your Terran pangolin as a counter-example, but does that little creature have the spiracle-bearing, ultrasensitive chemosensory tongue and majestic size of the bantha? No. I rest my case. Jawa 37C-H4 sketching droid illustration: My dissection of a bantha, showing the tongue attachments (note the distal bifurcation), digestive tract and foot structure. The colour variations in the digestive tract seem to be produced by commensal arthroreptiles. A naïve Terran like yourself might wonder why, of all things, a giant desert mammal such as the bantha would evolve to be clothed in thick fur. Here you would reveal your feeble way of grasping about the diversity of pangalactic Nature. First of all, banthas are not mammals as you know them; a Terran word like pseudomammal would suffice. 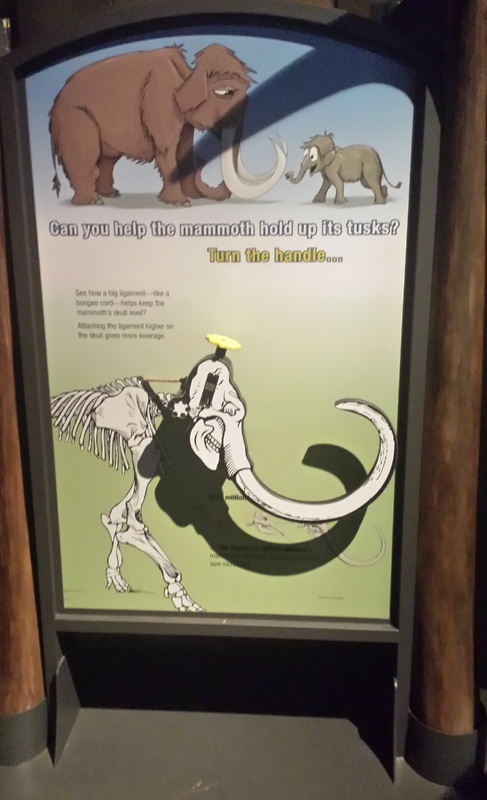 They lack the diagnostic traits of mammary glands, true hair, and inner ear bones that diagnose the Mammalia of your homeworld, but evolution at a giant size in a hot, dry clime has chastened them to become at least superficially similar to a Terran mammal such as an elephant or mammoth. One might be so naïve, even, to think that a bantha is merely a proboscidean in hairy disguise, but drive such thoughts from your rickety cerebral-implant-deprived mind. Behold, the true nature of bantha fur, as I have seen with microdroid holo-imaging: it is a second, external circulatory system of sorts. Simply put, the hairs have a thermo-conductive submolecular structure that deflects heat (and even, to a degree, the energy of a blaster) and traps cooler air near the body with an intricate network of cross-linking of barbed fibers more like a Terran bird’s feathers than mammalian hair. In this cooler locale, tracts of spongy skin tissue collect condensed water and direct it to absorbent epithelial beds on the chin and lips, belly, and toes, where the bantha imbibes it, or simply sheds it off to carry further heat away. Thus here we have a fascinating case of convergent evolution with the reptiliform dewbacks, but surpassing even that animal’s adaptation and evolving what you would likely call an air-conditioning system. Banthas cool themselves by circulating a slick of cool water around their body inside a heat-resistant fluffy outer mesh. Whether their horn tissues or tails contribute to this system is yet to be investigated. Lastly, I have conducted holo-viewings of the biomechanics of bantha gaits from numerous remote studies of wild and Sand People-ridden animals, in light of my own dissections of this bull. 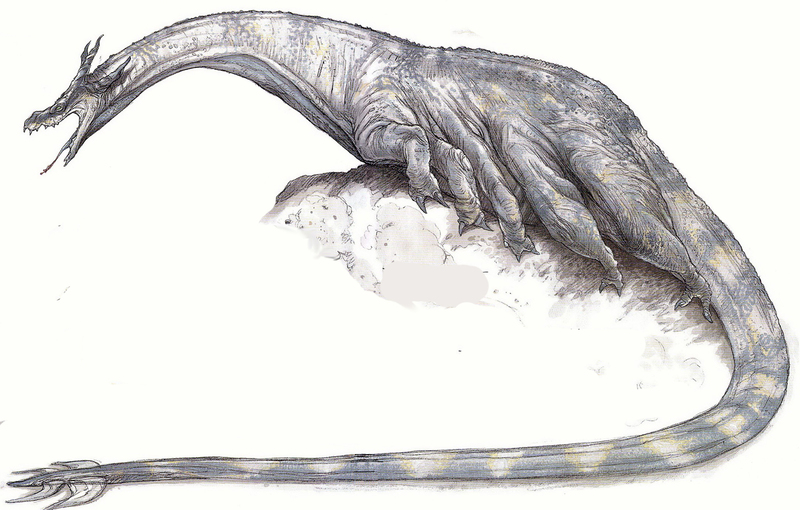 What strikes me is the phenomenal convergence with giant quadrupeds on your homeworld: like sauropods, elephants and other species, banthas have evolved “graviportal” or weight-bearing adaptations: (1) limbs that are proportionately longest above the elbow and knee, not distally elongated as in “cursorial” animals; (2) heavy, robust bones that lack much of a marrow space; (3) short, thickly padded feet ending in bulky claws or hooves (three toes in the case of banthas); (4) an emphasis on lateral sequence (left hind-left front-right hind-right front) footfalls when walking, extended to a slightly bouncing, rolling “amble” at faster speeds; (5) strongly vertical limbs when walking, using the limbs more like pillars to support the weight more effectively; and (6) slow maximal speeds, limited to ~7 Terran meters/second (24 kph/15mph) at best. 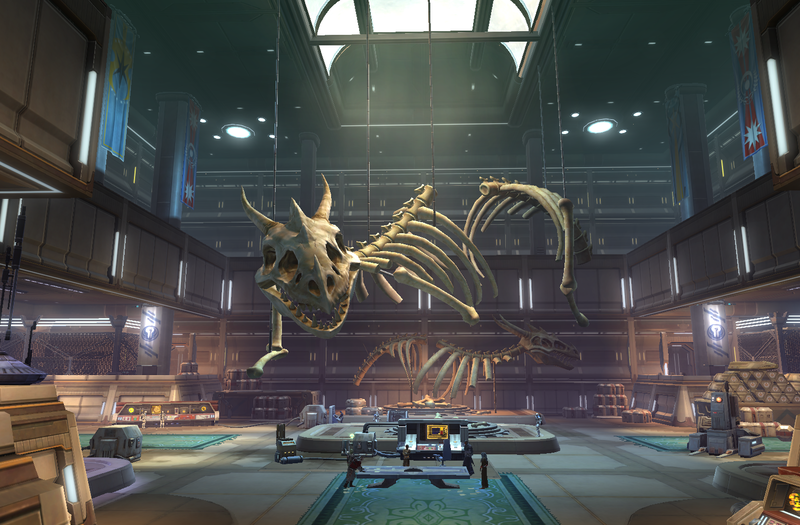 Ever since I left my home system, thoughts kept tumbling through my mind like rocks in an asteroid field, concerning the krayt dragon bones I had viewed in the museum on Corellia. With the krayt (Tyrannodraconis sp.) lineage reported extinct since at least the year 22 ABY, following much publicity of its awesome nature, its menace seemed now but a phantom. Consequently I could only fantasize of deeper study. That is, until a rumour came to me while resupplying in the well-preserved city of Bestine: not far off on the edge of the Jundland Wastes, a stormtrooper patrol had taken down a strange, enormous, multi-legged arthroreptile that had gone after their dewback mounts. A quick skyhopper flight and I was there, giddy with the adrenaline of impending discovery. It was a magnificent carcass. Sandworms and scurriers were already attempting to scavenge it, but with little luck and easily driven off with a few shots from my carbine. No stormtroopers remained (alive, anyway), so I didn’t get any details of the fracas that led to this well-timed demise, but the blast points on its body were too precise for sandpeople, and characteristic dewback tracks were everywhere. Even my antique lightsaber seemed poorly up to the task of dissecting this titan: it was over 30 meters (100 feet) long and surely 100 tons of Terran mass if not more; on the scale of your sauropods, but so vastly different in other ways. Right away, from its tracks I could see it had a peculiar mode of movement in life: it had slid up to some rocky cover in these badlands, dragging its belly and bulk along with ten limbs that were slender in comparison to its body, but still each as big as a large bantha’s. I took a deep breath and cut into what was the first Greater Krayt Dragon seen in some 255 years. 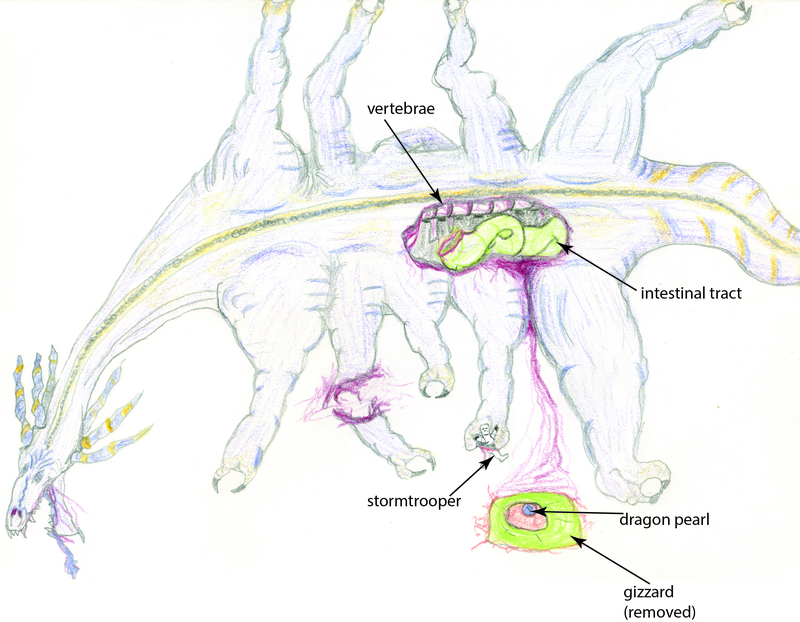 Jawa 37C-H4 sketching droid illustration: My dissection of the Greater Krayt Dragon, to extract the Dragon Pearl. The stormtrooper shown forgot the tale that Krayts take 1 hour to die, and so got too close too soon. If the bantha dissection was a rush job, this one was a sprint. Pockets of gas were forming and erupting while I sliced my way toward the bones and other organs of most interest, with the forces of decomposition slowly winning a race against my science. Oh, if only I’d had a Jawa sandcrawler to repurpose as a mobile freezer! And the sandworms and scurriers were still lurking about, with far nastier things surely soon to be drawn by the carnage out in these remote wastes. Those two days blurred exhaustion and inquiry and disgust and elation into a mire in my mind more pernicious than any on Dagobah. I’m no longer sure of what I saw– you’re probably wondering if I found the fabled krayt dragon pearl in the gizzard, and yes, there was one but I lost it somehow. Same with the venom sacs. Maybe I sipped from one of those; that would explain a lot. I made a sketch that I reproduce here, but then in a crazed, diaphonic state of dehydration and euphoria and frustration I am pretty sure I cut my sketching droid to pieces too, so this is all that remains to bolster my frazzled memories. Now that I’ve recovered and ruminated, I have come to some conclusions. First, I am left doubting all the little we know about krayt dragons. It is said that they existed in canyon, normal and greater species, and the immense variation of curved horns, clawed limbs and flanged tails lent this taxonomy much credibility in the past. But, call it chronic heatstroke or inspiration as you may, what if all krayt “species” are just stages of a long and repeatedly metamorphic developmental sequence? As my graph below shows, and this is admittedly pieced together from what few museum specimens and documents I have since marshalled to test my hypothesis, krayt traits change uniformly with their body size. As they get bigger, krayt dragons get more multi-legged and longer-necked, diverging from the form of their relatives (in the evolutionary sense of your sciences, sister group or outgroup) from Ruutan, the Kell dragons. The genus Tyrannodraconis, more so than the Kell, betrays its arthroreptile ancestry with their spines, exoskeletal plates, and tendency for polypedality. Their sternum also elongates to support their chest as they change from lumbering, bantha-chasing quadrupeds to slithering, sarlacc-snatching octa- or decapedal behemoths. 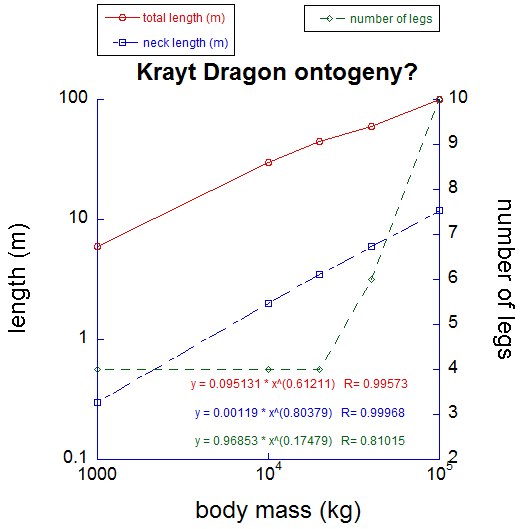 Although based on little concrete data, my analysis of known Krayt and related specimens suggests that they change continuously during ontogeny, although leg number may shift more suddenly (I predict this happens during their first metamorphosis at sexual maturity). Strong allometric scaling of neck and total length is evident- if the two lengths scaled as body mass0.33 they would be maintaining shape across the proposed growth series. But they don’t. I return to the best-documented krayt dragon remains: those that even Terrans have seen in the Rebel propaganda film you call “Episode IV”. Dr. Freezers, even your fellow blog-invigilators at SV-POW! discussed it. Witness the large size and long neck of the typical Krayt; whether horns existed or not in that form from the film is uncertain, and I note that these could even be a sexually dimorphic feature, but this is beside the point. Remnants of the body and limbs were never found. But this specimen fits well with my idea that all krayts are one species, or two at most—and how many top predatory megafaunal species could coexist on a desolate arid planet like Tatooine anyway? What still strikes me is the phenotypic variation in krayts: some large or small varieties have from two to four toes, and different scythe-like horns on their tail tips. This leads me to heap speculation atop my precarious pile of hypotheses: what if krayts are simply phenotypically labile, varying their traits almost stochastically between individuals due to relatively flexible ontogenetic programming, but still following strong overall trends as size increase, like those I have plotted above? Those stronger trends might be more tightly regulated by homeobox-like genes similar to those that have shaped so much of your Terran metazoan diversity, influencing features along the body axis like those I have mentioned (neck, limbs) across growth? I like this idea too much for it to be true, I admit. But if one krayt dragon existed just a short time ago, it is not simply fodder for the cryptoxenozoologists. And so, sooner or later, someone will answer my scientific salvo. I predict that burrows where the krayt dragons metamorphose between life stages, growing new legs and longer bodies, will be found in due time. In the case of dewbacks, this decrease of limb leverage seems offset by passive support from their pressurized scaly legs and enlarged whole-limb extensor muscles of their hindlegs, so they are overall about as well adapted to bursts of speed as large mammals from your world, such as buffalo or large antelope, even if their endurance suffers (a tradeoff, perhaps, for their reptile-like adaptations to desert life). In the case of banthas, they do no better or worse than elephants; all are slow due to their size and “graviportal” focus of adaptations. Like elephants, but unlike dewbacks, banthas do not “invest” more body mass into supportive leg muscle, and so they are slower than they might otherwise be. 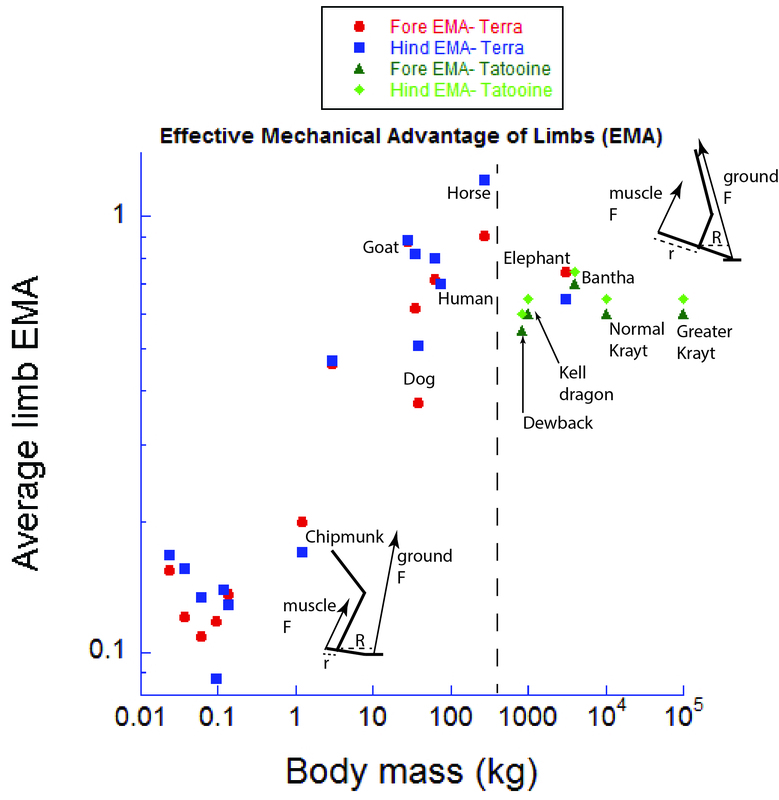 Effective mechanical advantage (EMA) of the limbs, with Terran data for mammals (red+blue) (source 1 and source 2), and my new data for Tatooine megafauna (green). Past a moderate size, EMA either declines or remains constant. Once the limbs are fairly straight (near the size of a Terran horse, or Tatooine eopie; vertical dashed line), EMA cannot be much improved. But the krayts (young or smaller species aside) suffer more from their size than other Tatooine megafauna, as they do not increase their limbs’ mechanical advantage any more than the others do, and so they must become slower as they grow. This explains, however, why their ecology shifts from being a mobile predator when smaller (feeding on dewback, then bantha-sized prey) to being more of an ambush predator or specialist on slow/immobile prey like sarlaccs as they attain titanic sizes. Their limbs, despite becoming more numerous, must become less able to support them as size increases, as in other Terran and Tatooine megafauna, and thus they are destined to benefit from giant size (in many ways, including near-invulnerability and capacity to take the largest prey) at a cost of athleticism (but with prey like sarlaccs, who needs it?). In the greater, or fully mature, krayt dragons, I suggest that the limbs each become less supportive and more of a stabilizer to prevent their slug-like bulk from rolling over, or a set of “oars” to help them navigate through sandy environments like the Dune Seas. They support their weight not so much with limbs and levers, but with a larger, cuirass-like breastbone system, rings of muscles and fibrous tissue, and their whole elongate body. The ultimate implications of my biomechanical research are summarized below—I am sure you will agree with my reasoning. Maximal speed vs. body mass data from (black) Terran animals (source), and (green) Tatooine megafauna (plus non-native Kell dragons for comparison). As size increases past ~100 kg mass (when EMA in the other graph above is already maximal), speed inevitably declines. As for those that have said that Greater Krayt Dragons and such are thereby confined to a life as scavengers and nothing more, I would welcome them to explore the Jundland Wastes locales armoured by all the security that this foolish notion provides. I, for one, would enjoy viewing such a visit, but only remotely via a probe droid’s holo-feed. 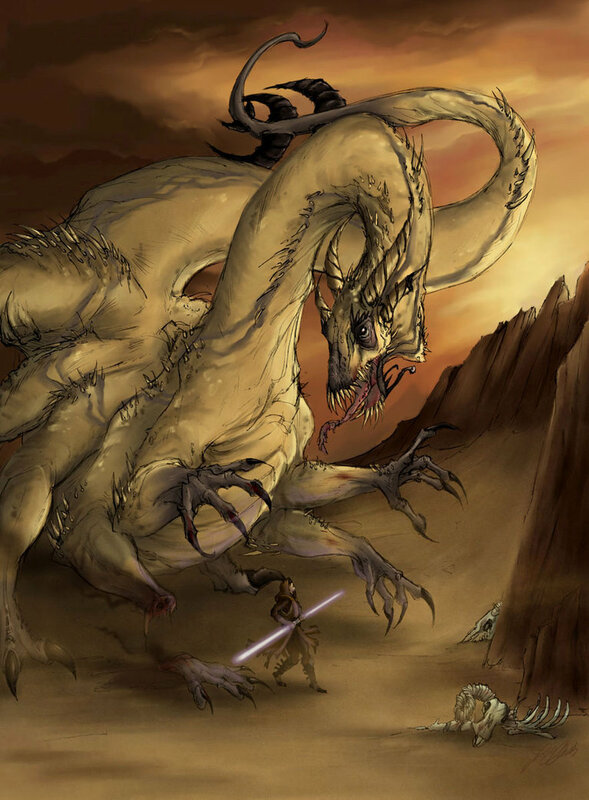 One of your Terran artists (jeddibub on deviantart) produced a provocative imagining of a Greater Krayt Dragon facing a Jedi. I’d wager for the former. I submit this report in honour of Empress Syrrhosyx and the Fourth Empire– may you find the contents enlightening and may her rule grace your benighted homeworld before you, too, have nothing left of your megafauna but stories of dragons. I welcome your comments, and perhaps some of your lauded “freezerinos” would care to comment below—but they must behave themselves, lest I find cause to deposit them in carbonite for hyperspace shipping to a lonely suffering on a lonely planet! I shall shortly return this “blog” to your control, when the mood strikes me. That is the deal for this correspondence. Pray I don’t alter it any further. Err, hi there Zhonav. That was quite a post. I’m still taking it in. And laughing at your 37C-H4 sketching droid illustrations, which I could have done just as well with my daughter’s coloured pencil set. Technological superiority, eh? I’ll have my blog back now, please? No disintegration. Ouch! Stop that! I’m still reading your post! Have you been taking (screen)writing lessons from Peter Jackson? It is true, our galaxy is full of far greater wonders than your Milquetoast Way. And our glorious Empress shows us how to appreciate them. Is this published? I’d recommend “The Biological Journal of the Outer Rim Territories”, although the peer reviewers have been known to rip people’s arms out of their sockets when challenged. Published? Peer review? Such Terran concepts. Perhaps my transmission was unclear in one regard. My word carries the full weight of Empress Syrrhosyx’s, irrespective of where I place my word. None outside the Imperial Science Department would dare challenge it. However, repeating the word of an Imperial Knowledge Harvester is a high form of homage among the obeisant subjects. If you wish to “publish” my unaltered words in that or any other forum, you may. Keep it up, and one day you might join our triumphant corps! Easy there, Zhonav. Be nice to my blog commenters or you’ll find yourself labelled as a spam account faster than you can say “Bantha fodder”! on July 24, 2014 at 6:02 am | Reply When Science Looks Seriously At A…Star Wars Planet | The Tech Showdown! About those siliceoderms. Wouldn’t they be indicative of some long lasting contact with some other galaxy, far, far away? Somethin’ familiar about ’em. Nothing to see here, move along. These aren’t the siliceoderms you’re looking for. OK no more Sith mind tricks from you, Zhonav! Your transmission was interesting, but until we’re graced with faster-than-light travel we’ll be more than content with our amazing Terran fauna. And good manners. Bye!